This report allows you to keep an eye on backup job configuration changes that occurred during a specified period. The Summary section includes the Job Modifications by User and Modifications by Day charts. 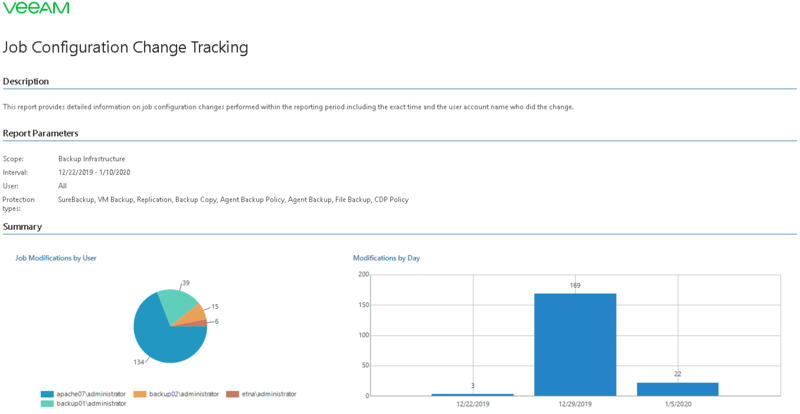 The charts display the number of job configuration changes performed by each authorized user and the daily number of changes. The Details table provides information about every change performed within the reporting period. They include information about the backup server where the change was made, job changed, wizard page, property changed, previous and new setting values, modification date and time, and name of the user who made the change. Interval/Start Date – End Date: defines the time period to analyze in the report. User: defines users whose activity must be analyzed. Job Type: defines a job type that should be evaluated (Backup, Replication, File to Tape, Backup to Tape, Backup Copy, Failover Plan, SQL Log Backup, SureBackup, All items). Since jobs can be configured from the Veeam Backup & Replication console, Veeam Backup Enterprise Manager console, using PowerShell scripts or through REST API, in large environments with multiple backup administrators it is often hard to tell who, when and what changed. The report helps you review user activity, track job modifications and simplifying troubleshooting.